Eliza Gilkyson. Photo by Alan Pogue / The Rag Blog. Eliza Gilkyson was Thorne Dreyer’s guest on Rag Radio, Friday, December 16, 2011. Gilkyson, a Grammy-nominated recording artist and a member of the Texas Music Hall of Fame, is one of the most respected musicians in folk and Americana music circles. The daughter of legendary songwriter Terry Gilkyson, Eliza grew up in Los Angeles and now lives in Austin. Gilkyson has appeared on NPR and Austin City Limits and has toured with Richard Thompson, Patty Griffin, and Mary Chapin Carpenter. Her songs have been recorded and performed by such greats as Rosanne Cash, Tom Rush, and Joan Baez, who covered Eliza’s song “Requiem,” which was originally written as a prayer for those who lost lives in the devastating tsunami in Southeast Asia and was featured on NPR’s All Things Considered. It has been nominated for two Grammys on different recordings. In the past year, Eliza recorded two new albums: the Billboard-charting Red Horse and Roses at the End of Time, her first new solo recording in three years. 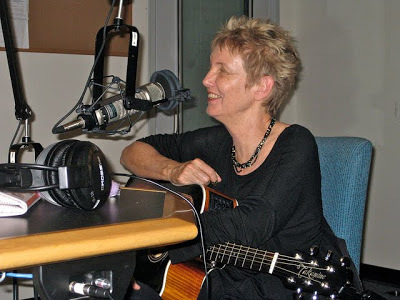 This episode of Rag Radio includes live performance and recorded music by Eliza Gilkyson. 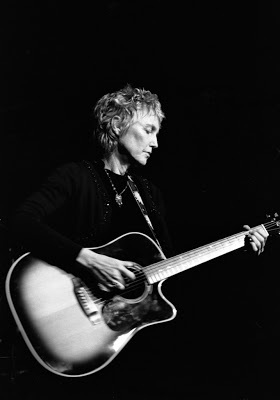 Above, Eliza Gilkyson, photographed live at the KOOP studios in Austin. In inset, Gilkyson is shown with Rag Radio’s Tracey Schulz (left) and Thorne Dreyer. Photos by Carlos Lowry / The Rag Blog. 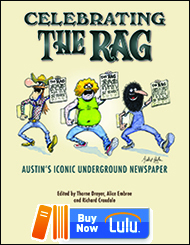 Rag Radio — hosted and produced by Rag Blog editor Thorne Dreyer — is broadcast every Friday from 2-3 p.m. (CST) on KOOP 91.7-FM in Austin, and streamed live on the web. 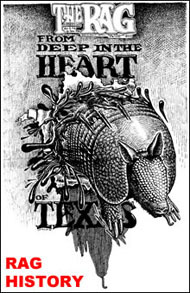 KOOP is an all-volunteer cooperatively-run community radio station in Austin, Texas. Rag Radio is also rebroadcast on Sundays at 10 a.m. (Eastern) on WFTE, 90.3-FM in Mt. Cobb, PA, and 105.7-FM in Scranton, PA. Rag Radio is produced in the KOOP studios, in association with The Rag Blog, a progressive internet newsmagazine, and the New Journalism Project, a Texas 501(c)(3) nonprofit corporation. 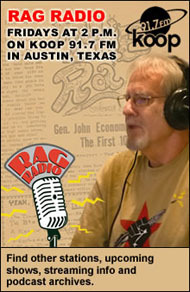 Dec. 23, 2011 [Best of Rag Radio]: Anarchist community organizer scott crow, author of Black Flags and Windmills (originally recorded Aug. 5, 2011). Dec. 30, 2011: Environmentalist and global warming activist Bruce Melton. Jan. 6, 2012: New Years Special with SDS founder and political activist Tom Hayden. 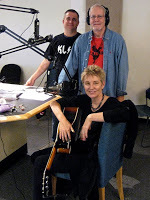 This entry was posted in RagBlog and tagged Austin Musicians, Eliza Gilkyson, Inteview, Rag Radio, Singer-Songwriters, Thorne Dreyer. Bookmark the permalink.